Outdoors Magic has given an early welcome for The UK’s County Tops (the ‘ideal step’ for anyone weary of the usual hill lists), published last week. I’ve copied the text below – or click here to see the real thing. It’s the ideal next step for anyone who’s already knocked off the Munros, Corbetts, Marilyns, Wainwrights, Donalds, Grahams and whatever other peaky tick-lists you can think of and the author should know what he’s on about as he was the first person to summit all 91 tops in a single 5,000-mile walking and cycling expedition back in 2006. It’s a 205-page, medium-format paperback clearly laid-out and nicely produced in the recent Cicerone style. The book’s divided into country sections and works through each in a logical progression so, for example, the England bit begins with Brown Willy, the highest point in Corwall and finishes on the Cheviot in Northumberland. Each top gets, usually, a double-page spread with a quick description of the hill, image(s) and some background details, a location map plus a brief route description illustrated with a proper OS map extract. The whole concept is, of course, ridiculous, but then that’s part of its charm and Muir never pretends otherwise. And there’s a certain amusing daftness to any book that can go from Boring Field at one extreme – a whopping 80m in height, comment: ‘the clue is in the name’ – right up to the brooding 1344m lump of displaced alpine rockiness that is Ben Nevis at the other. It’s nicely written too and beautifully self-effacing, so while we can’t really endorse the idea that the process of climbing all 91 county tops makes any sense, it’s as reasonable as any other tick list and a lot more amusing than most, even if you doubt you’ll ever bother ticking off Great Wood, Boring Field, or Cold Overton Park. Interestingly, Welsh hill names disguise their relative smallness behind exotic celtic nomenclature and even the smallest, Holyhead Mountain at 220m puffs itself up with that macho name. 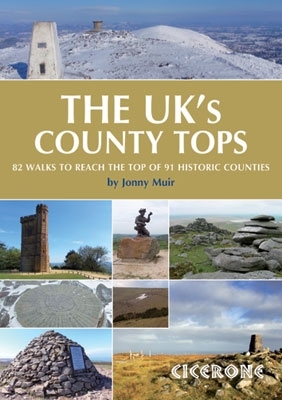 The UK’s County Tops is out now from Cicerone at £11.96 on their web site. More info at www.ciceronepress.co.uk.